When it comes to windows, doors and conservatories you will hear the term U-Value quite a lot, but what does it actually mean? U-Value is a way of measuring the thermal efficiency of a material/product such as windows, doors, walls ect. The lower the U-Value the better insulated the material is. U-value is measured in watts per metre-squared kelvin, or W/m2K. In other words, it is the amount of energy (in Watts, or W) that travels through one square metre of a material (m2) per every 1 degree of temperature difference between inside and outside (K). Now I have just confused you haven’t I! So to put it simply it’s a measurement of the overall heat energy transfer rate through a particular section of construction material, e.g. roof, walls, glazing etc. The lower the rating the more you save on your energy bills and the more comfortable the room temperature will be. Building regulations state that different materials need to have a minimum U-Value but a lot of materials exceed these ratings, in the glazing industry glass is one of the materials you will see a lot of coverage about when it comes to U-Value, some glass units can have a U-Value of as low as 0.6! An A+6 rated window (glass and frame) will have a rating of about 1.4 but you must not forget that other materials such as frames all have U-Values too, so combining the best energy efficient products is essential to get the best overall U-Value. 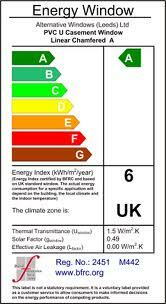 You may see these images on certain websites showing you what Windows Energy Ratings (WER) they offer..
You’ll notice that anything below an A is a negative number, A rating will be from 0 upwards with a U-Value of around 1.4. These are usually supplied to installers by the manufacturer or fabricator but it is not compulsory for the installer to show them on their websites. If you are still reading this then well done! Just have one last thing to share with you, ever heard of G-Value! This is Window Solar Factor: It measures the amount of heat gain from sunlight. The Solar Factor is expressed as a number between 0 and 1. A lower Solar Factor means less heat gain. This is for the whole window not just the glass. Posted in Help & Advice and tagged Double Glazing Advice, Double Glazing Blog, What does U-Value in Windows Mean?.